Fire & Light Glassware plates...hand poured glassware. Created for both form & functionality, Fire & Light glassware is known for its vibrant color & texture...there is nothing else like it! 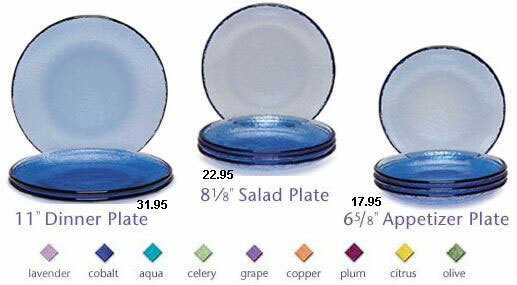 Please see color palette for color selection of plates. The crafts people at Fire & Light handcraft artful pieces of glassware one by one, much as it has been done for centuries! Made from recycled glass in the U.S.A, all Fire & Light glassware dishes are dishwasher safe, however, they are not recommended for the microwave. Fire & Light Glassware Plates.